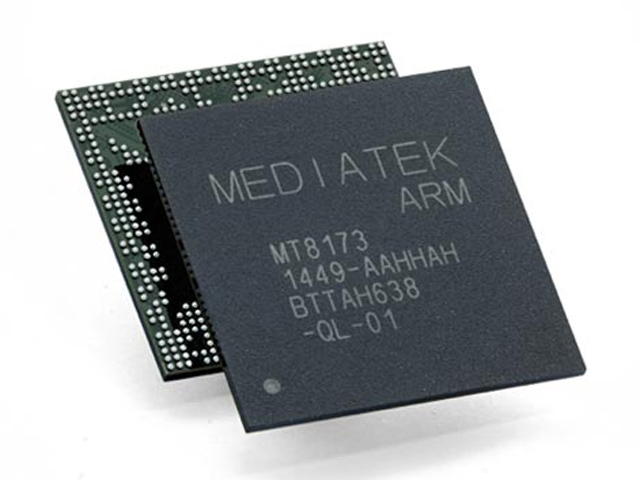 The Mediatek MT8173 is an upper mainstream ARM SoC (System on a chip) that was introduced in March 2015 and is primarily used for Android based tablets. It is manufactured in a 28 nm process and has a total of four CPU cores with two Cortex-A72 and two Cortex-A53 cores in a big.LITTLE configuration. The graphics unit is based on the IMG Series 6XT (Rogue) and has the designation PowerVR GX6250. Among others, the GPU includes a video decoder with 4K and H.265 support. The biggest highlight of the SoC are the new Cortex-A72 cores, which can be seen as the successors to the Cortex-A57 design. ARM promises much more performance in combination with reduced power consumption, which results in an excellent per-thread performance with the very high maximum clock of 2.4 GHz. The architecture is based on ARMv8-ISA and therefore supports 64-bit. The two slower, but therefore very frugal Cortex-A53 cores (clocks unknown, probably around 1.5 GHz) are supposed to reduce the power consumption and are always active with light workloads. The big.LITTLE configuration also allows the simultaneous use of all four cores (or any combination of cores from both clusters), so the MT8173 can be called a real quad-core. The graphics unit is based on Series 6XT (Rogue) from IMG and has the designation PowerVR GX6250. The 2-cluster chip has a unified-shader architecture with a total of 64 FP32 ALUs as well as 4 TMUs. Thanks to the comparatively high maximum clock of 700 MHz, the performance is roughly on par with the PowerVR G6430 in the iPhone 5s. High-resolution screens and complex Android games from 2015 are usually no problem for the GPU. Besides CPU and GPU, the chip is also equipped with an LPDDR3 memory controller (2x 32-bit, probably up to 933 MHz, 14.9 GB/s), but no wireless modem. The maximum display resolution is 2560 x 1600 pixels. Another highlight is the integrated video engine, which even supports 4K material and the modern H.265 codec. The MT8173 is manufactured in an 28 nm process and should have a average up to high power consumption. It can still be used in tablets without limitations. The Mediatek MT8176 is an upper mainstream ARM SoC (System on a chip) that was introduced in October 2016 and is primarily used for Android based tablets. It has two fast Cortex-A72 CPU cores running at up to 2.1 GHz and four Cortex-A53 cores for power-saving in a big.LITTLE configuration. The graphics unit is based on the IMG Series 6XT (Rogue) and has the designation PowerVR GX6250 clocked at 600 MHz. Among others, the GPU includes a video decoder with 4K and H.265 support (not verified, but was already the case for the older MT8173). The four slower, but therefore very frugal Cortex-A53 cores (clocks unknown, probably around 1.4 GHz) are supposed to reduce the power consumption and are always active with light workloads. The big.LITTLE configuration also allows the simultaneous use of all six cores (or any combination of cores from both clusters), so the MT8173 can be called a real hexa-core. The graphics unit is based on Series 6XT (Rogue) from IMG and has the designation PowerVR GX6250. The 2-cluster chip has a unified-shader architecture with a total of 64 FP32 ALUs as well as 4 TMUs. Compared to the MT8173, the clocks were reduced from 700 to 600 MHz, so the gaming performance is a bit lower. High-resolution screens and complex Android games should be powered without bigger problems.